We would like to say a huge thanks to Greyhound Gap for taking on Shandy. Shandy was brought into us via the St Helens dog wardens on June 6th. She is ID chipped but unfortunately her details weren’t up to date and no one came forward to claim her. 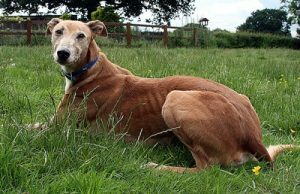 Greyhound Gap kindly offered to take her on and will look to find her the perfect forever home. We shall look forward to keeping an eye on Shandy’s progress! This entry was posted in Uncategorised on 18th June 2016 by admin.